Can a blessing turn out to be a curse? Can it be that the one thing you have yearned for—to the extent that it now seems an impossible dream—is suddenly given to you, and you realize it was not what you wanted, after all? Is there really any truth in the adage about being careful what you wish for, because it may come true? 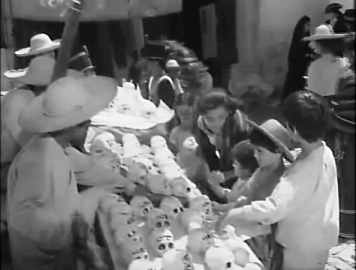 Macario, the first Mexican film to be nominated for an Oscar for Best Foreign Film, begins just before the Day of the Dead, the Mexican festival that honours the dead. Against a backdrop of processions, of grinning skulls and skeletons crafted from bread or sugar, the credits roll, ending at the small hut of the woodcutter Macario (Ignacio López Tarso). Macario’s wife (Pina Pellicer) and her many children are getting ready for the Day of the Dead. The mother lights a small earthen lamp in memory of her mother-in-law (“Because she was so good to us”), and one of the younger children asks, “Will you light a candle for Papa too?”, and is told no, because Papa is still alive. Alive, yes, as we see when the tall, lanky Macario, having felled a tree and chopped it down, comes home that evening. But what sort of life is this? The food on the table is so little that even before it has been apportioned, one of the children has already gobbled down his share and is asking for more. Soon, all the children are clamouring for more. Macario pushes away his plate and leaves the table, saying he isn’t hungry, and that the children can have what’s on his plate. Even before he’s gone, so is the food on his plate. The next day, Macario and his family go to the town on various errands. Macario has to deliver wood to the bakery; his wife, who does laundry, has to take clean, starched clothes to the home of the wealthy Don Ramiros. 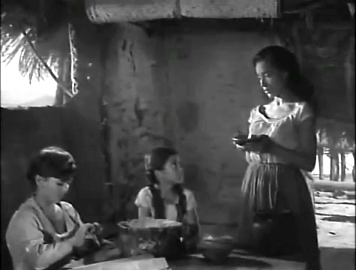 Chona, the maid at Don Ramiros’s, is kindly disposed towards Macario’s wife, and asks after the family. 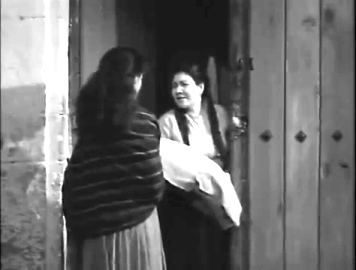 Macario’s wife asks Chona to remind Doña Eulalia (Don Ramiros’s wife) about a tip in celebration of the festival, and Chona promises she will. The children, meanwhile, have been wandering about the square, gawping at all the sugary goodies on sale. Most households have also laid out splendid banquets for the dead to feast on, and just looking at these forbidden treats makes the children’s mouths water. 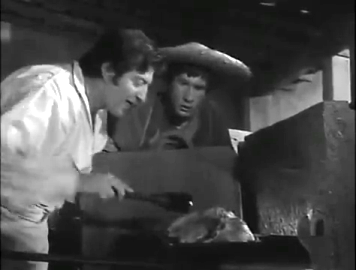 … And later, as Don Ramiros’s men carry away the cooked turkeys, one turkey per salver, one salver per man. Later that day, Macario cannot stop himself from baring the bitterness in his heart to his wife. All he wants, he bursts out, is to be able to eat one turkey by himself. Not share. Not share with anyone. All his life, he has never known what it is like to have a full stomach; and, though he obviously loves his wife and his children very much, his one desire is to, just for once, eat a whole turkey by himself. Because it’s a dream that will never come true—and Macario knows that—he says that he will not eat anything, now. He even pushes away the packet of food his wife tries to give him as he leaves for the woods. Later that day, Macario’s wife goes, as before, to Don Ramiros’s wife. 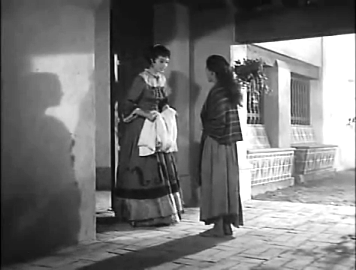 Chona warns her friend: Doña Eulalia is in a horrible mood. And sure enough, Macario’s wife receives a dose of the aristocrat’s anger: why weren’t her skirts properly starched? 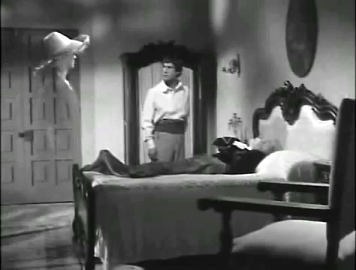 That the laundress did not have money to buy starch is no concern of hers; Doña Eulalia throws the garments back at Macario’s wife and tells her to do them again. She will not pay for this. Doña Eulalia slams the door. As she’s crossing the yard to go back, Macario’s wife sees a flock of turkeys pecking in the yard. So many of them, all fat and sleek! And that promise of Macario’s, that one single wish of his… with a quick glance around to make sure the coast is clear, Macario’s wife rushes in amidst the turkeys and manages to grab one. She wraps it in the voluminous garments she’s carrying, and smuggles it home, where she guards it zealously from vultures, a dog, and even from her children. The next day, as Macario is setting out for the woods, his wife comes running up, with a large packet for him. It’s the turkey, which she’s roasted especially for her husband. She urges him to take it and go quickly into the woods, before even the children can see: because if they see, they will want a share. And she wants him to eat all of it. Macario is touched, but his hunger is so great that he obeys and, taking the turkey, goes into the woods to eat. Barely has he sat down and unwrapped the turkey than a splendidly dressed man (looking rather like a successful bandit, actually) appears. He (José Gálvez) asks for some of the turkey. If Macario will give him one turkey leg, he’ll give Macario his silver spurs. Macario refuses; he doesn’t have a horse; what will he do with spurs? Very well, then; how about a breast, in exchange for the row of fine gold coins that form the buttons on this gaudily attired gentleman’s trousers? No thank you, says Macario. He’s a poor man; if he were to try and sell that gold, he would immediately be arrested as a thief. Then, says the man in a last-ditch attempt, how about if I give you this entire forest? It’s not yours to give, Macario points out. And how would it help me, anyway? I’d still have to cut down the trees and chop the wood. When Macario looks up again, the man’s vanished, and Macario, not wanting to be interrupted again, leaves the spot and makes his way to a more secluded space, where he once again unwraps the turkey. Again, even before he can cut the bird, a visitor arrives. 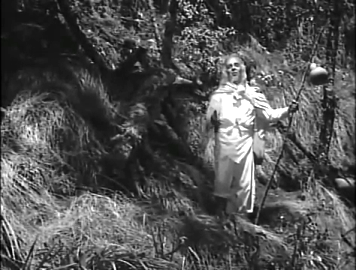 This is an old man (José Luis Jimenez) dressed as a hermit. He asks if Macario will share his food with him, and Macario refuses. He says he knows this is a test of his generosity; what need does the old man have of his food? 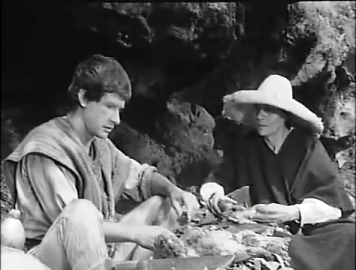 The old man disappears, and Macario once again gathers up his turkey and moves off, this time to the mountainside. Again, an intruder arrives, asking for a portion of the turkey. This (Enrique Lucero) is a man dressed as a peasant, and his excuse for asking for a share of the turkey is simple: he’s hungry. He hasn’t eaten for thousands of years, he says. Macario shrugs, looking resigned to his fate, and invites the man to sit. He cuts the turkey in half, and they eat. Once they’ve finished their meal, the man asks Macario why he (Macario) agreed to share his turkey with him, and not with the others. By now, Macario has figured out who these men are. The one who tried to lure him was none other than the Tempter himself, the Devil. The one who tried to test him—who is always testing us all—was God, and this man, constantly hungry, never satisfied, is none other than Death. He tells Death that he had recognized Death right at the start, and had realized, too, that it would make no difference whether he, Macario, said yes or no; either way, Death would have his way. Death is so amused by this that he decides to bestow a gift on Macario. With his foot, he scrapes out a hollow in the ground, from which springs up a little rivulet of water. 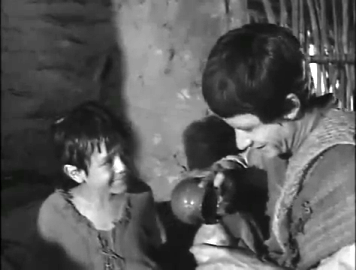 Taking Macario’s gourd, which he’s instructed Macario to empty, Death fills it with water from this miracle spring. He recorks the gourd, suppresses the spring so that it vanishes, and hands the gourd to Macario. This water, Death tells Macario, is healing water. Just one drop of it, and Macario will be able to bring even a dying man back to full health. If Death decrees. When Macario goes to a sick man, he should look towards the patient’s bed: if the man is destined to live, Macario will see Death standing at the foot of his bed. Then, a drop of this water given to the sick man, and he will be well again. But if Macario sees Death standing at the head of the bed, it means the dying person is doomed; Macario need not waste any of the precious water on him. And precious it is, for this is all there is, and all there will be. 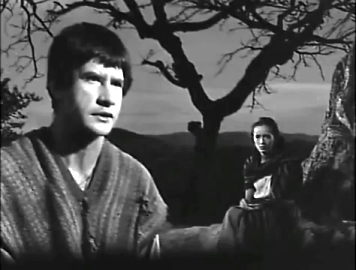 Death, in leaving, tells Macario that this is the last time they will talk; Macario will see Death again, but only see him, not be able to converse. Also, in response to Macario’s question about how he’s supposed to know whether the water is efficacious or not, Death assures him: Macario will, very soon, get the opportunity to test it. Not in a way that Macario would have liked, though. Macario is heading back home from the woods when two of his children come running along the path with news. One of their siblings has fallen down and hurt himself badly. When Macario gets home, he finds that the neighbours have gathered around the still little figure on the bed, and everybody is whispering that there’s no hope. So, half-fearful, half-hopeful, Macario sends everybody, including his wife, out of the room, and looks back towards his son’s bed… and yes, there, at the foot of the bed, stands Death. 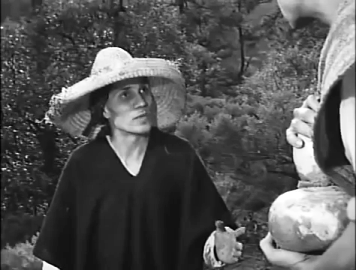 Quickly, Macario uncorks his gourd and gives his child a sip of the water. Sure enough, the very next instant, the boy has regained consciousness and is perfectly fine. Very soon, the news of Macario’s miracle has spread in town. The baker asks him if it’s true, and how did Macario acquire such powers? 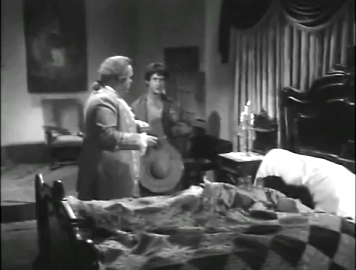 (He’s pretty miffed when Macario hedges) Chona asks Macario’s wife if it’s true, too, and says that perhaps Don Ramiros should ask Macario to take a look at Doña Eulalia, who has been very ill these past few days. The doctor has been putting leeches on her and has tried many medicines, but nothing seems to work. 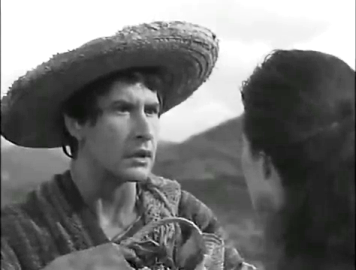 Unsurprisingly, a couple of days later, Don Ramiros does approach Macario, asking him to heal his wife. He will pay whatever Macario will ask. 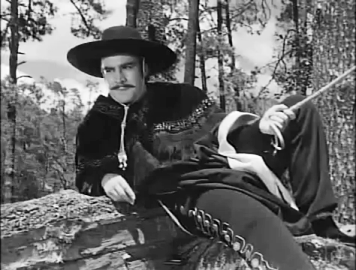 Macario asks how much Don Ramiros would be willing to pay for his wife’s life, and when Don Ramiros says, “Ten ounces of gold”, Macario says he will take a hundred ounces, no less. Later, however, when Doña Eulalia is sitting up, recovered (Death had stood at the foot of her bed), Macario only accepts the ten ounces of gold. His integrity will not let him take more. And Don Ramiros, quick to scent out an opportunity to make money, starts making lists of his acquaintances who are known to be unwell. Within a few days, Macario has been given the designation of consulting physician, for the guest house that Don Ramiros has converted his home into. With the very first patient who arrives—a doddering old gentleman who has to be carried into the house—Macario is a success. 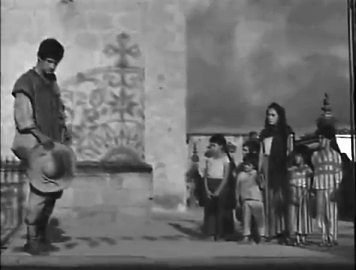 Because Death, standing at the old man’s feet, nods and allows Macario to administer his miracle water. 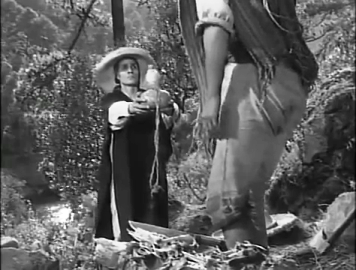 Two bags of coins are tossed to Don Ramiros, who keeps one and hands the other (the lighter one) to Macario. It’s not long before the wealth comes pouring in. 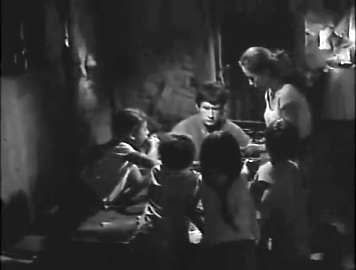 Macario becomes so rich that he and his family leave their hut in the mountains and come to town, where they live in a grand mansion—so large that Macario’s wife and the children get lost in its passages, and the children, used to sleeping beside their parents, get scared at night sleeping in their own room. But there’s more than enough to eat, and Macario will never have to give up his own food for his children. How long will it last, though? That water isn’t endless; there’s only that one gourdful, and even if Macario portions it out very carefully, it still won’t last forever. What then? And what if something else should happen? I loved this film. It is an almost fairytale-like story (not surprising, since the novel from which it was adapted was based on a Grimm fairytale), about the good deed that’s rewarded with a boon and the consequences of it. A universal story, which is perhaps what adds to its charm: it’s easy to identify with Macario’s essentially good and upright nature, yet empathize with his frustration at his own poverty, his inability to keep going hungry any longer. The simplicity of the story, and the way it’s told. This is a gripping tale, not merely because it moves swiftly, but because it makes you wonder which direction it’s going to take. There is, after all, the fact that Macario’s new-found wealth is the result of something finite. He, all said and done, has no real control over it. You can see the end approaching, but when it’ll come and what shape it will take, no-one knows. Not even Macario. The characterizations, especially of Macario and his wife. They are poor people, essentially good and honest people, but that doesn’t make them incorrigibly self-sacrificing or martyrish. Macario, for instance, and his confession to his wife about not wanting to share his food any more, not even with his children. And his wife, though a good woman, stealing that turkey—and understanding her husband’s hunger enough to urge him to take away the roasted turkey before the children see it. It doesn’t mean she doesn’t love her children, or that she’s depriving them; it’s just that she realizes, perhaps, how very desperate this need of Macario’s has become. 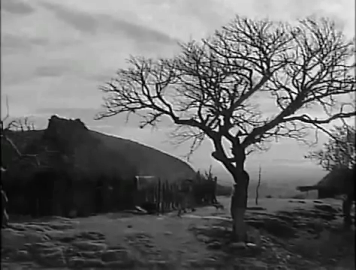 And, the cinematography, which I loved. The windswept trees outside Macario’s hut, on that otherwise bare hill. The mist in the mountains. The macabre confectionery skulls and skeletons, dancing about on strings and poles in the marketplace. 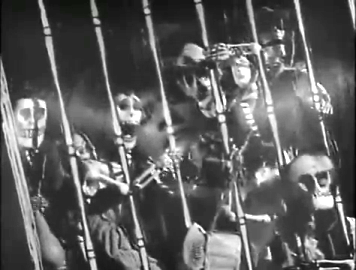 (And, in one eerie dream sequence, appearing as skeletal puppets wearing the clothes of Macario’s wife and children, looting Don Ramiros’s banquet tables while Macario, the puppeteer, pulls their strings). Lastly, the entire allegory of death and life, especially death. Centred very appropriately on the Day of the Dead, Macario makes several points regarding death. You never know when you will meet death—you could be in the prime of life, bursting with health, and death may sweep you away. And death will neither be held away nor bargained with; you can try all you want, plead, offer whatever enticements you wish—but when death comes, it gives no quarter. Death will take those he has to, and leave those he has to, and none of us poor mortals can ever truly control death, no matter what illusion might convince us that we do. Do watch this film. It’s a superb one. Wow! Sounds gorgeous, and your writing gave me the chills. Will put a watch for this one. Thanks, Madhu. Thank you, Anu, and yes, do watch this (as Ashish has mentioned below, it’s also available on Youtube, just in case you don’t find it on Netflix – though I think you should be able to). It’s a wonderful, thought-provoking film. It’s not on Netflix. That’s the first place I checked. YouTube version is pretty good as it has subtitles. :) Thanks, Ashish. I will go straight to YouTube, then. Wonderful review Madhu didi! I’m honestly amazed at how you manage to so completely understand a film that has been made in a language you’re not familiar with.. That too a film like this ( though I think it is a part of ‘world’ cinema) that is so entrenched in the rituals and customs of its region. Agreed subtitles are there, but to write this kind of review, one needs to go beyond what gets to see. You’re the greatest!!! But I’ve never really warmed up to movies in foreign languages didi I don’t know why. I’m only comfortable with Indian movies for some reason, maybe the familiarity with the locales is the reason, for I’m very sensitive to such things. Reading your reviews though definitely helps! I even liked your review of Chemmeen.. Thanks a lot for the review didi!! I’m so glad you liked this review, Rahul (and the review of Chemmeen). This was a great film, and there was really nothing that I couldn’t say I didn’t like about the film – it was really good. I understand what you say about foreign films. I grew up on a diet of Hindi cinema and Hollywood (plus some British cinema, especially Hitchcock), but this was in the good old days when we mainly saw movies on Doordarshan and its one lone channel – we basically saw anything that was being aired! So I suppose that meant we also saw several movies that we might not have seen in the normal course of events, if we’d had much choice. Sometimes they flopped, sometimes they left a lasting impression… and I think the whole point is that it depends upon the type of film. There are certain films that manage to be very universal; you may not as completely understand the nuances as a native would, but there’s something about the film that makes it easy to relate to. I will. Am already thinking of which films I need to put in that list. What an interesting tale, told by a talented writer, our own Madhu deciphering the language for us. Rahulsaran above has put your talent for reviews quite aptly. Between yourself and Anu, i have been introduced to many foreign and Indian regional films, some I have watched, some are still on the list to watch, however I feel I have seen them all through your eyes and pen, well typed words.. Thanks for widening my interests. Thank you so much, Neeru, for the appreciation. I have a cousin, and a blog reader, to thank for the foreign films I review on this blog. When I first began blogging, I’d intended this to be a blog dedicated to old Hindi cinema and old Hollywood. A cousin asked me, then, if I’d also review foreign films, and a blog reader – Bawa, who lives in Spain – gifted me the DVD of a brilliant Spanish film, Bienvenido, Mr Marshall – which encouraged me to step out of what I thought of as my comfort zone. I now love exploring cinema from other countries, so much so that about 80% of the cinema I now watch is non-Indian, non-English language. What a great write up Madhu! Your preamble was so intriguing that I just continued to read until you left me high and dry (obviously for spoiler reasons) – I must watch this movie. I found it on youtube with subtitles (link below). I guess I am off to watching this. Will report back when I am done. I do hope you enjoy the film as much as I did – and do, please, come back here and tell us what you thought of it. Finished watching it last night as my curiosity got better of me. What a wonderful movie at many different levels. Great concept and powerful underlying message that so subtly conveys to be good and not worry about death because it is inevitable and is non-negotiable. There were many dialogues in the movie that left a deep impression on me – one of them was ” when we are born, we are born with part of death in our stomach or heart”. I was dreading to see when does the situation arrive when he sees death at the head of the bed… They kept it all so real despite the potential for making this a dramatic one. I love that aspect of the movie.. It was also impressive to note that this power doesn’t change Macario (or his wife) as a person – a kind soul. It could have changed many people exposing their real selves.. Very well made movie and I don’t think language is a barrier (thanks to subtitles). I kept on seeing Balraj Sahani in Macario all throughout the movie – same structure and demeanor too..
A great movie and a brilliant write up Madhu. Thanks for recommending this gem! I am so glad you liked the film as much as I did, Ashish. As I mentioned in my comment to Rahul, I think there’s a particular element of what I can only define as ‘universality’ which can make a film appeal to people who don’t have very much in common with the unique culture in which the story is set – and Macario has it. That’s a good point you mention about how wealth does not change Macario and his wife. True; they remain as they were. And Balraj Sahni would have been the perfect actor for the role if they’d ever made this in India (though, offhand, I can’t think of any Indian films which really attempt this ‘magical realism’ to any extent. We stop at mythologicals and the occasional fantasy film – or Ramsay Brothers! – but a ‘serious’ film that combines the real world with the supernatural is not often seen). this movie seems like do bigha zameen to me. i do want to watch this. its look like film of bimal roy school. and i got remember christmas carol of charles dicken . struggle for turkey by bob crachit and his family. No, it’s nothing like Do Bigha Zameen, except for the main protagonist being very poor. The entire concept – of a serious, ‘real world’ meeting the supernatural – is not something that’s been done often in Hindi cinema, so this is very different from any Hindi film I’ve ever seen. It’s an amazing film; do watch if you can. I’m so glad, that you’d the opportunity to watch it at last. I saw it some two years back, when we had students from our hostel show us their favourite films. The Mexican guys showed us Macario and I was practically floored by it. I think we discussed this on FB at that time and if I’ve not forgotten, I’d sent you the youtube link as well. Sometime afterwards, we also celebrated the Day of the Dead with other Mexican friend of mine. Good food and really interesting rituals. An amazing movie with an amazing end. Just like your stories with the twist in the end. I am so grateful to you for suggesting this to me, Harvey! I have been meaning to watch this for a while, and kept forgetting. Then, last week sometime, I suddenly remembered I hadn’t watched this… so I started seeing it, and was so completely hooked, I saw it all at one go. What a brilliant film. And yes, what a superb end, too. I hadn’t seen that coming – but it was so appropriate, wasn’t it? So ironic. WONDERFUL,WONDERFUL. I love the review, I notice someone has found it on YouTube, I have bookmarked it. I will watch later, I am dying to know how it ends, How do you unearth such gems? I cannot take any credit for unearthing this film, Shilpi – Harvey was the one who saw it (according to his comment, above, some Mexican friends showed it to him), and he told me about it. It’s a superb film, do watch it!